Later today at 10 am Christie's will be holding a sale of antiquities in the Rockefeller Plaza, New York. Readers will be aware that concerns have been raised about three lots (104, 112, 139) that appear to be close to objects that feature in the Medici Dossier seized in the Geneva Freeport. Are they the same? What due diligence searches have been undertaken by the staff at Christie's to ensure that they are not selling ex-Medici material? What reassurances can be given to potential buyers? Why did Christie's fail to mention the Sotheby's London collecting history for one of the pieces when the catalogue first appeared? 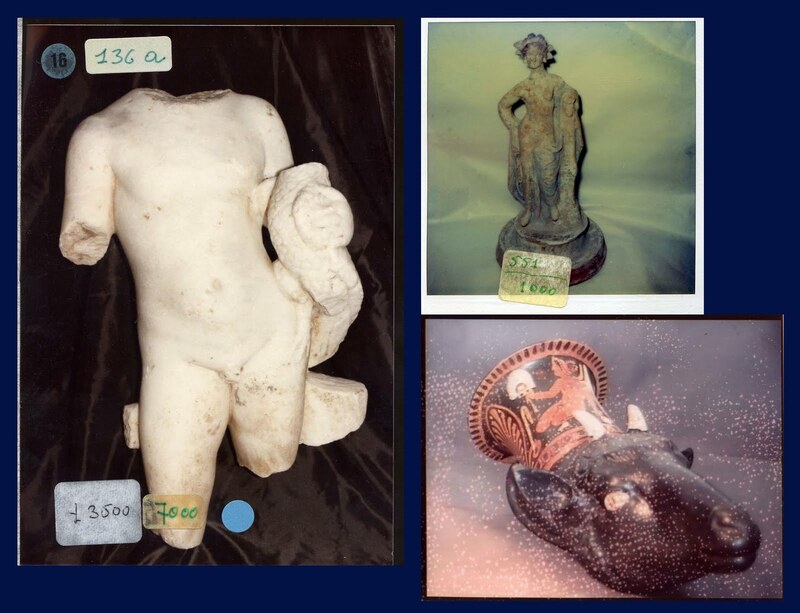 Christie's has made it clear that the sale of the objects would "proceed" in spite of a call for the three lots to be "repatriated" by an Italian prosecutor closely linked to the return of some 130 objects from North American collections. It was added, "Christie's has undertaken its own research into this matter and has found no evidence to support the need to withdraw these lots". What is the nature of this research? Who has been contacted? What is the full "provenance" (or more accurately collecting history) for these three pieces? At the end of May 2010 Max Bernheimer of Christie's reminded us that provenance was "paramount". If that is the case, what is the full "provenance" for these three pieces? Has it been established how the three pieces entered the market? The last word must rest with the spokesperson for Christie's commenting on the issue in May 2010: "we do not sell works that we have reason to believe are stolen". Three objects from the Medici Dossier (courtesy of Christos Tsirogiannis).